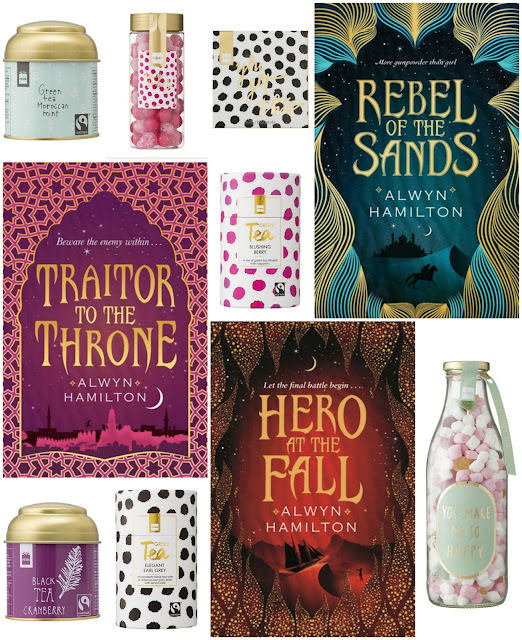 Enter this giveaway for a chance to win books by Alwyn Hamilton, tea, candy and chocolate. Good luck! I love that fantasies can take me into an exciting new world with so much to discover, it's so intriguing. Fantasy is one my favourite genres. I enjoy books like Game of Thrones and Lord of the Rings and could read them multiple times. The back story, history, names, fantasy elements and story are unforgettable and resonate long after you've put it down. Fantasy takes me on a mental vacation where I can go on adventure I wouldn’t be able to enjoy otherwise!! I love the magic of them! I like the worldbuilding and sense of escapism. I think I love fantasy because you can escape into another world when you read fantasy books. I enjoy the world building. It can be anything, anywhere! fantasy takes me to another world so I can escape life's problems! J'adore être emportée dans un autre monde , un autre univers ou un lieu magique !!!! I'm always mystified at the how much imagination others have that can easily transport me to another world. Fantasy takes me to another realm where I can leave this world with all its troubles behind. I love that Fantasy sparks the imagination and challenges parts of the brain that aren't used on a regular basis. Escaping to another world, and lots of magic! That you can escape into another world where anything can happen! Love to discover new worlds and they mystery and magic. Great way to escape and dream the impossible. I love the creativity, imagination, and the escape from reality. I wouldn't normally choose a fantasy book but if I did it would have to include romance. I like reading Fantasy books because my imagination soars and makes me happy. I like the very different worlds it takes you to, and also, in recent years, the heroines tend to be really great. It always takes me to somewhere I've never been to. Somewhere new and exciting. Loved the first book and would love to read and own the rest! Fantasy allows me a way to both relax and experience amazing things. Best of both worlds! I love adventures but I also love my bed. Fantasy can make a not so great day turn into a day to escape! It's so different from anything else and the possibilities are unlimited. Love those magical moments it creates. I love the alternative realities that you can be transported to, fantasy provides you with true escapism. I love fantasy because it’s such a nice escape from reality, but I also love the creative world building and the new adventures. It keeps it interesting and exciting. I love fantasy because it doesn't have to be subject to the rules of nature and science as we know them. I like the world created. the escape of the real world! I love how they take me to a whole new world! I like fantasy because all things are possible. I find that fascinating. I like fantasy because it allows you to escape from every day life. I'm a very practical person, so I like that fantasy wrenches me out of my comfort zone. I love that you can escape in to a different world one that is full of magic. the getting away from my real life. Love the names of the characters and worlds they often use in fantasy novels and the fact that the only rule seems to be "there is no rule" which is a great thing as you never know what's going to happen. Also really like the use of dragons and other "fantasy" creatures in some novels. I love the element of magic & sorcery in fantasy worlds!